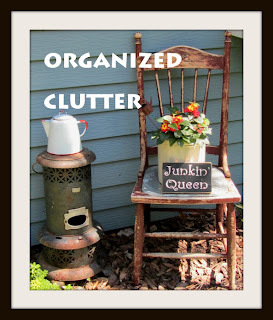 Signs are perfect with the cottage, junk style of my gardens and yard. I am not a sign painter, and I don't have to be one either, as I have two friends who paint great signs. 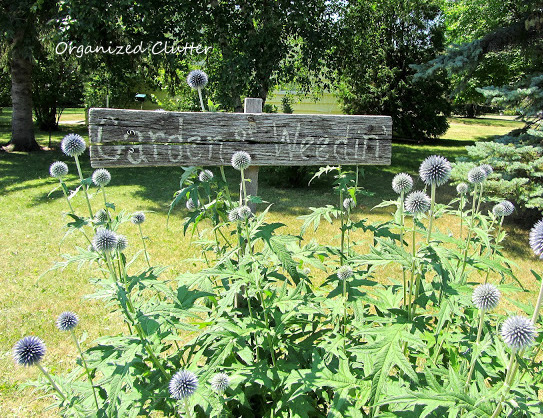 This "Garden of Weed'n" sign on old weathered wood has been a fixture in my front flower border for years. My geranium sign usually hangs above my potting bench. My husband and my mother were both worried that someone would stop by wanting to purchase geraniums at my house. LOL! It has never happened! This was a new purchase this year, a fun subway art style flower name sign. This vintage garden sign was also new this season. It works well with my vintage junk! Also new this season, the Chicken Coop sign is in a bed with metal roosters, chicken feeders and is hanging on an egg crate. 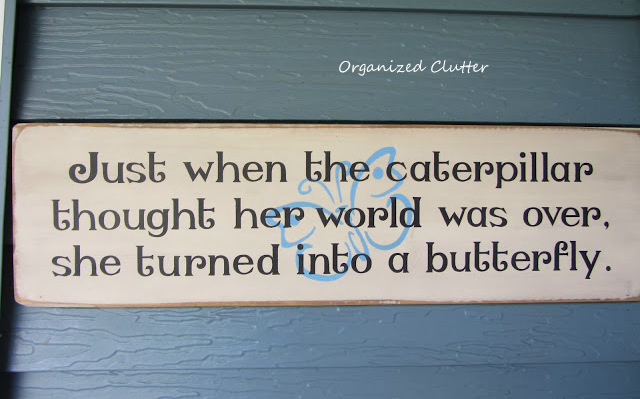 A weathered wood "Garden" sign has a spool dragonfly with screen wings on the step ladder. This "Bless the Blooms" engraved spoon is held by my garden angel. My "Plant Pray Grow" spoon is in a teacup of angelina. My "life" for 3 1/2 months in the summer! This sign also goes well in my junk gardens. Most of the time they grow just fine! This fence post with simply "flowers" moves all over the yard and gardens. 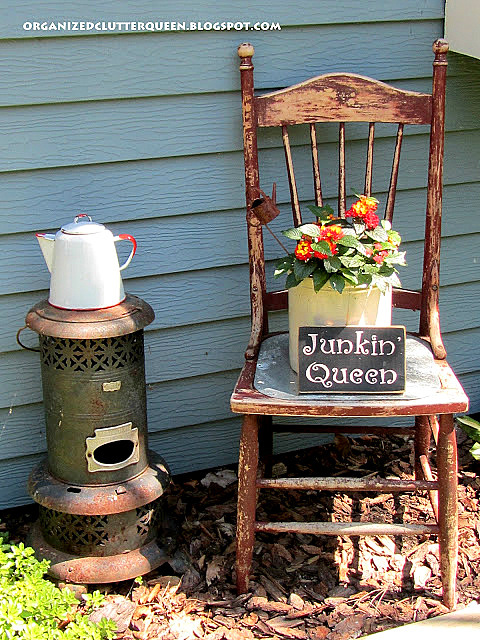 My "Junkin' Queen" sign has worked in many different areas of the garden. Signs will always be a part of my gardens! What is your favorite garden sign? I like the Garden of Weedin and the sweet spoon signs. Thanks for sharing your garden. It is definitely whimsical and colorful! I love all of your signs Carlene! Your so clever with your decorating and flowers, beautiful stuff there girlfriend! p.s. summer is coming back next week, we will be upper 80's to low 90's, go figure huh. Love your garden signs. I have a few in my garden. I have a friend that does amazing signs - she is a great artists. Your signs look great in your garden. Thanks for sharing and giving me ideas. Hi Carlene! Oh, how sweet. I love every one of your little garden signs. I love all your garden signs. I've been afraid to put any out this year, because someone took some out of my flower gardens last year.